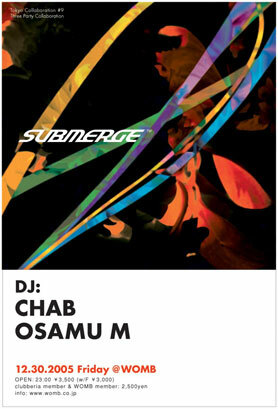 Being supported by many of the top International Djs like John Digweed, Sasha, Deep Dish and Hernan Cattaneo, it is no doubt that Osamu M is one of the brightest hopes from the Japanese club music scene. Having appeared on John Digweed's Kiss 100 radio show 5 times, the profile of Osamu M has been spread around for last several months, and this momentum has been strengthened by releases like "Waterdrop" from Desyn Masiello's Alternative Route Recordings, as well as the remix project of Guy Gerber's stoppage time, that was just released from John Digweed's Bedrock records last October. This is the 1st set of his resident performance on HigherFrequency's new project entitled "Residents", and the set you will be listening to is his performance that was recorded live at Maniac Love in October 2005, just before this legendary club closed in early December. He will be performing at Womb 30th Dec Tokyo collaboration, with progressive rising star Chab, if you like this mix, and have never seen him play before, this would be a good night to start.